The decorative instinct of Mitchell Jacobs, one half of the team behind accessories brand Penrose, is something I’ve written about briefly before. But I had a chance recently to delve further into the craft behind the weaving and finishing of Mitchell’s designs. I was particularly interested in the Debussy scarf shown above, the blue version of which I often wear with a navy overcoat. While it is silk, the weight of the yarn and the way it is woven create a matte finish and much more substantial handle. It avoids the flyaway, effete look that puts me off many silk scarves. The silk is woven on vintage, pedal-operated looms, which are all 140 centimetres across. The scarf is cut across from selvedge to selvedge and then folded over and stitched by hand, creating a tubular shape. The pin fringing at the edges is also done by hand, stripping down each individual thread. The yarn is very dense to begin with and the old-fashioned loom enhances this effect. It and the antique finish were inspired by a 1950s Italian scarf Mitchell wears when touring by motorcycle. I know the designs, and particularly the colours, are not to everyone’s taste. 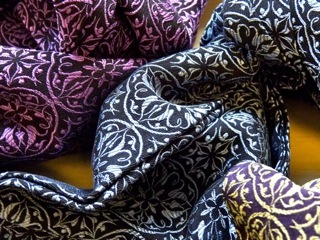 But for me they are more interesting and original than the traditional paisley and polka dot silks. The Debussy design here was apparently taken from a medieval book cover Mitchell found in an Antwerp flea market. So I suppose it is traditional in its way too. Penrose’s website is now much improved and can be found here. But there is still little to browse in terms of product – for that you’ll need to go to Harvey Nicks, Selfridge’s or Liberty in London, or Bloomingdales (New York) and Shrine (Chicago) in the US. Other stockists here. You can follow the discussion on Vintage silk weaving at Penrose by entering your email address in the box below. You will then receive an email every time a new comment is added. These will also contain a link to a page where you can stop the alerts, and remove all of your related data from the site. Penrose are the most elusive company out there. I bought one of their silk scarves in Liberty, loved it; I’ve kept an eye out for them ever since. Their old website was merely a placeholder. Their update barely expands it and has hopelessly scant illustration of their current products. And as for their stockists, since I bought a scarf of theirs 18 months ago a mere handful of subsequent products have dribbled into Liberty since – a couple of scarves and a half dozen ties. It’s almost as if they’re determined not to make their products available. Which is more the shame since they’re quite superior. Awesome article! I really like it. Mitchell Jacobs scarf designs are so glamorous. You need to own one to be at least satisfied. Thank you for the very informative post. Its a pleasure reading your compiled work. I concur with Prairie Oysters completely. Mystique is a sought after quality, but Penrose is either taking it too far, or simply haven’t put the effort into getting their goods out there. The web site doesn’t show off the range, let alone have anything for sale. Drake’s has a very well designed site, with clear illustrations, and it’s possible to place an order. I don’t think their cache or reputation suffer at all as a result. The stockists are another matter. Over here I looked in Montreal and Toronto, but the listed retailers don’t actually have any Penrose on the premises. All the same, thank you Simon for first bringing this name to my attention with your earlier post. I await the day I can handle one of their scarves in person.